It has been reported that Chelsea signing Cesc Fabregas has gone back on his word to Arsenal fans after leaving for Barcelona three years ago. Former Arsenal captain Fabregas completed a £27m move to Chelsea earlier today after Barcelona decided to cash in on the Spain midfielder. The move to Stamford Bridge sees Fabregas go back on a promise he made before departing north London, after insisting he would not ‘do a Fernando Torres’ and play for another Premier League club. “If some day I leave Arsenal it will never be to sign for another English team. 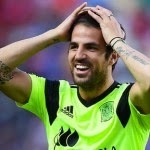 I’m very sure,” Fabregas told Spanish magazine Don Balon in 2011.